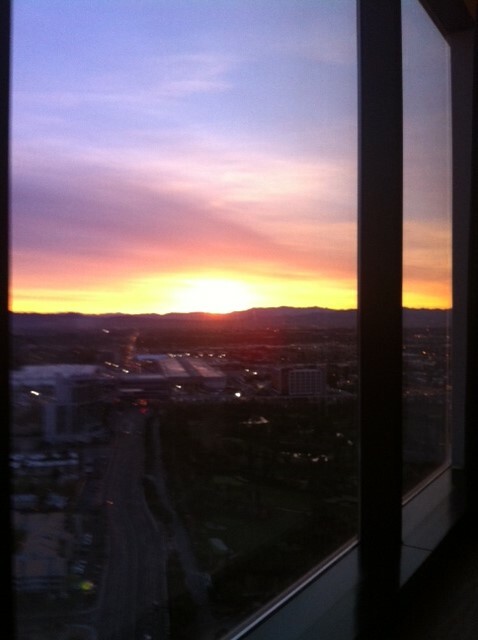 This morning from the 39th floor of a Las Vegas hotel room I watched the sun rise over the mountains. Impervious to the sweeping humanity below them, these mountains are the area’s only static feature and serve as a boundary to the manic development. Without their silent enforcement, who knows how big Las Vegas could get? No way will this city stop itself. You don’t spend much time in your room, luxurious though it is. 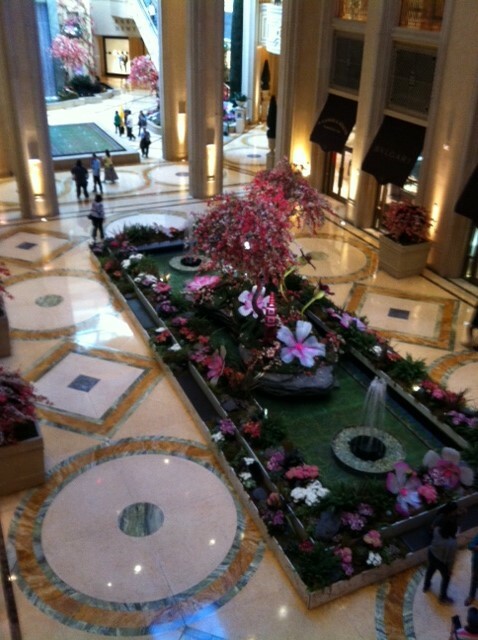 You spend lots of time walking through the hotel. This is because the exits are few and far between; if it weren’t for fire safety, there probably wouldn’t be any. Reaching one of these secret outlets requires a winding trek past Baccarat and Black Jack tables; past acres of glowing slot machines; past Chanel, Cartier, Hermes, Gucci, Rolex; past sleek bars and stylish restaurants; past dazzling chandeliers, color-changing waterfalls, giant silk flowers, colossal glass balloons, massive mosaics. Stunned by the cumulative effect of these displays, you wander for hours, lost in time, for there are no clocks in these hotels and no windows. Light and temperature, meticulously controlled, are designed to make your body forget itself. In an effort to keep guests inside at all costs, many hotels have joined forces and created connecting passageways. These escalators and skywalks are so effortless, so discreet, that you usually unaware of the transition. 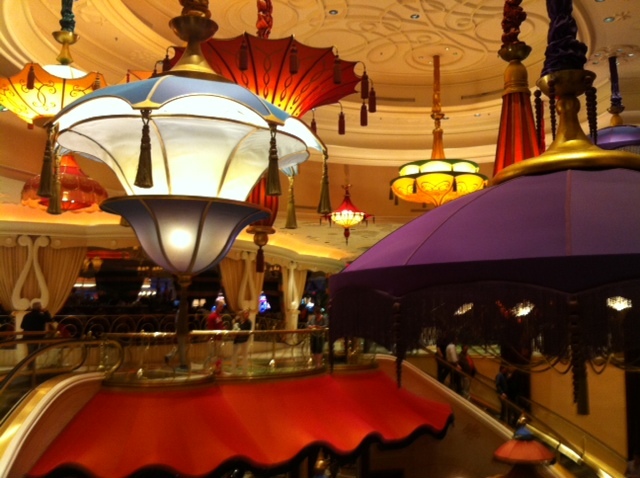 How did you get from the Encore to the Venetian, from the Palazzo to Caesar’s Palace? At last, exhausted by the journey, the visual stimulation, the constant campaign of music, you stumble into a lounge or restaurant and blearily eye the menu. By then you are inured to the exorbitant prices and scarcely bother to look at them. What did you expect? This is, after all, Las Vegas. If you think a hotel that charges $370 a night should not charge another $20 for WiFi, you have a point, but so what? Money reigns supreme here. To suggest it has a limit amounts to blasphemy. If you cannot get into the spirit of spending, you need to leave the premises. Nothing personal—you just don’t belong. I had not been to this city in fifteen years. Previously, I recall being charmed by the clever use of faux materials. This time the sets were alarmingly real. As I walked across miles of Italian marble, I began to understand the extent of the riches involved and it made me queasy. Many people loathe Las Vegas. It is a reckless, heedless city. It stands for all the wrong things. One day this city will run out of water—the one thing it does not have a surfeit of—and nature will be the big winner. The mountains are out there waiting. I have never been to Las Vegas and have never wanted to go. Your blog pointed out all the reasons I didn’t even know about. Thank you for this. I’ll take the reality of the wide open spaces fraught with uncertainty any day. Susan, as always, I appreciate your loyal readership and your discerning eye.